Primary care PBRNs bring together researchers and groups of clinicians and practices with the goal of improving health services delivery and closing the gap between research and practice. The aim is to stimulate the development of appropriate research that reflects the context of healthcare practice in a primary care setting. 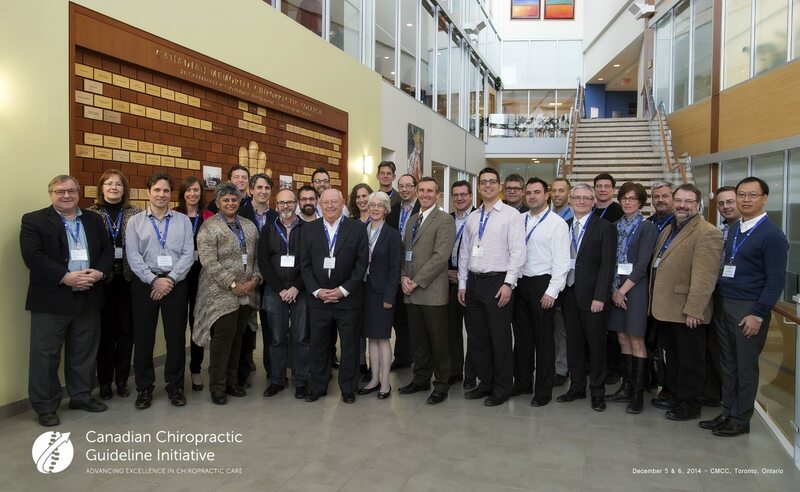 In December 2014, the Canadian Chiropractic Guideline Initiative held the first meeting of the Chiropractic PBRN. We are delighted to announce the winners of the CCGI competition for seed funds for 2018-19. Dr. Peter Stilwell and his team in Atlantic Canada will be looking at barriers and facilitators to implementing online patient-reported outcome and experience measures. 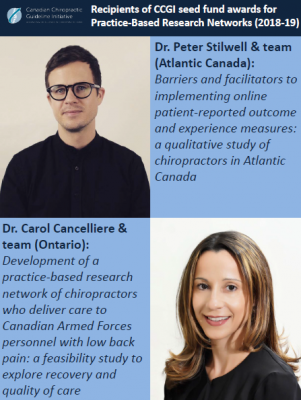 Dr. Carol Cancelliere and her team in Ontario will be looking at developing a PBRN of chiropractors who deliver care to Canadian Armed forces personnel with low back pain. Congratulations to both teams! 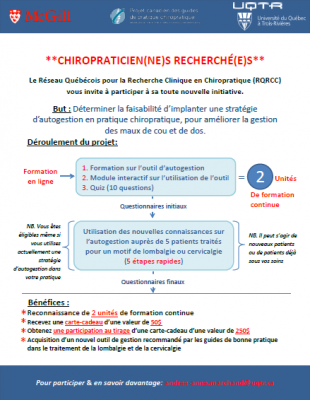 The Québec PBRN is now recruiting participants for a study on the feasibility of implementing a self-management strategy to improve the treatment of neck pain and low back pain. Participating chiropractors will receive two hours of continuing education, a $50 gift card, will be entered into a prize draw to win a $250 gift card, and the opportunity to learn a new skill recommended by the latest best practice guidelines. Click on the links below for more details on how to sign up. How to disseminate your research: Getting your message heard – and used. Download this NHS National Institute of Health Research guide for researchers who are applying for funding or have research in progress. It is designed to help you to plan your dissemination and give your research every chance of being utilised. CCGI provided seed funding for three PBRN start-ups in Canada in 2016 (Project leads: Dr. Jeff Quon (BC), Dr. Jill Hayden (NS) and Dr. Simon French (ON). New CCGI seed funds were awarded to two further PBRNs in March 2017: Dr. Peter Stilwell (NS) and Dre. 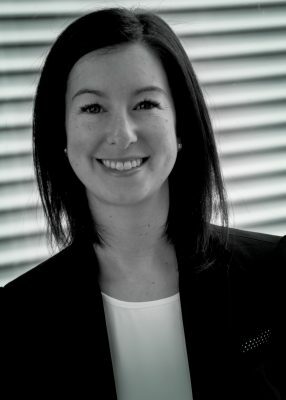 Andrée-Anne Marchand (QC). Applications for CCGI seed funds for local PBRNs for 2018 are now being accepted. The deadline for submissions is 15 January 2018 and projects are expected to run from 1 April 2018 to 31 March 2019. The research question should concern practice-based research in chiropractic. Priority in this funding round will be given to at least one project using an online data collection tool. If you have any questions please do not hesitate to contact Heather Owens, Research Manager at howens@chiropractic.ca. 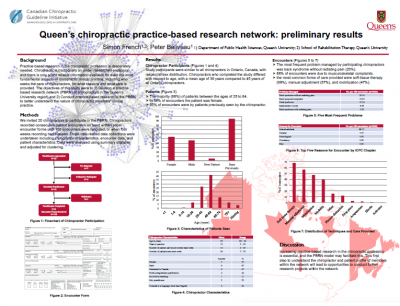 Dr. Simon French, DC, PhD led a team of researchers (Dr. Peter Beliveau (project Lead), Dr. Jeff Quon and Dr. Jill Hayden) in collaboration with Queen’s University Chiropractic PBRN. The study looked at helping chiropractors and chiropractic academics to work more closely together to improve quality of patient care. A scientific poster was accepted for poster presentation at World Federation of Chiropractic 2017 Convention in Washington, DC. Click on the poster to learn more, or download the pdf here. Congratulations to Dre. Andrée-Anne Marchand and the research team in Québec who were awarded one of two CCGI seed fund awards for practice-based research networks in 2017. Their study is a mixed methods pilot cluster-randomized controlled trial, looking at promoting the use of a self-management strategy among chiropractors treating individuals with spine pain. Congratulations to Dr. Peter Stilwell and Dr. Katherine Harman and the research team in Nova Scotia who were awarded one of two CCGI seed fund awards for practice-based research networks in 2017. Their study is looking at communication styles used by chiropractors consulting with patients experiencing low back pain. Applications for CCGI seed funds for local PBRNs for 2017 are now being accepted. The deadline for submissions is 20 January 2017 and projects are expected to run from 1 April 2017 to 31 March 2018. The research question should concern practice-based research in chiropractic. If you have any questions about the Research Fund Proposal Guidelines 2017 and the Application Form 2017 please do not hesitate to contact Heather Owens, Research Manager at howens@chiropractic.ca. Click here to read the newly published scoping review by Dr. André Bussières et al. 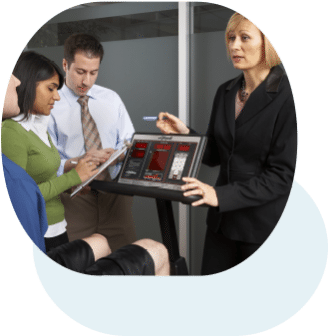 on evidence-based practice, research utilization and knowledge translation in chiropractic. Thank you to the outstanding and dedicated team of CCGI members who worked on this important review of attitudes and beliefs about EBP, guideline adherence, implementation and dissemination. 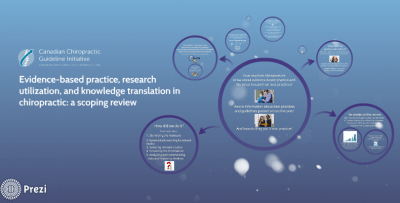 View this Prezi to see a summary of results from the scoping review.